As John F Kennedy would have said if he had known Cross Rhythms: "Do not ask what Cross Rhythms can do for you but ask instead what you can do for Cross Rhythms!" So, are you adventurous? Up for a small challenge? Then why not consider doing a sponsored event and help support the work of Cross Rhythms as you do? Or simply give your support and encouragement to those who are taking on such a challenge and sponsor them. 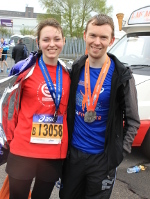 On April 6th 2014 Cross Rhythms presenters Chris and Emily completed the Manchester Marathon as a team, running half each. Emily said "I really enjoyed doing the marathon. It was one of the most challenging things I have done. It was a really great day! I loved doing it in aid of Cross Rhythms and I chose to run as I wanted to give something back, as I have learnt so much from Cross Rhythms and want to see others impacted just as I have been by the work that they do." 2. ABSEILING THE WORLD'S TALLEST ABSEIL TOWER! On May 10th 2014 Cross Rhythms CEO Jonathan Bellamy, Maxine Cummings and Jess Critchley abseiled down the world's tallest abseil tower to raise funds for Cross Rhythms! Located in Northampton, at 418 feet (127m) it is nearly half the height of The Shard (the tallest skyscraper in Western Europe)! Maxine said: "When asked if I would 'abseil for Cross Rhythms' I hardly hesitated, even though I'd never abseiled before. I wanted to do my part in helping to raise funds for the radio station/website as I believe in their vision to 'reach millions for Christ' and music is such an accessible way to do this." And on 5th July 2014, 15 year-old Sam Critchley abseiled the same tower to raise money for Cross Rhythms. He said, “I chose to abseil, because providing alternative ways of teaching about Christianity is an important thing, and I think that Cross Rhythms does something unique for people, and is great at doing so!" On April 27th 2014 long time Cross Rhythms supporter Jon Fulcher took part in the Malvern Hills Lions Charity hill walk from the Herefordshire Beacon on the Malvern Hills to the Worcestershire Beacon on the Malvern Hills and back again...a distance of about 7 miles. He walked to raise money for Cross Rhythms and the Lions nominated charity, Diabetes UK. What can you do? It might be a parachute jump, a swim across a lake, a cup cake sale or even a sponsored silence! If you would like to raise money for Cross Rhythms, then please email supporter[dot]services[at]crossrhythms[dot]co[dot]uk and we will give you all the administrative help you need.